Need to whip up some vegan-friendly party appetizers? Try these delicious Greek-inspired dishes. Last month, I was preparing to host a swanky cocktail party, and I wanted to serve Greek-themed party food. I suddenly realized that more than a handful of my guests were vegan, so I needed appropriate appetizers. I came down with a mild case of party panic because while there are lots of stellar vegan cookbooks, most of them don’t contain a ton of appetizer offerings. After a little research, I discovered some great options that I was confident omnivores would enjoy as well. My first pick was a recipe for garlicky basil hummus that Dr. Srefania Knurick shared with us. Serve with raw carrots, celery, or slices of red pepper. My next pick, also a Dr. Knurick recipe, seemed too easy and good to be true. Stuff almonds into olives and enjoy. This recipe inspired me to stuff olives with all kinds of vegan delights, such as pureed tomato and basil with olive oil, cashew cheese with marinated hot Italian peppers, and macadamia nuts and vegan cream cheese. I created a festive olive platter. Next, I decided to fill espresso mugs with soup, and I used a vegan version of another delicious Dr. Knurick recipe. In a large pot, warm up the olive oil and start to sweat the onions on medium-low heat. When the onions look translucent, add the garlic and cook for 30 seconds until fragrant. Stir in the carrots, bay leaves and oregano. Add the sugar and deglaze the pan with the vinegar. Pour in the diced tomatoes, including their juice, the lentils, and the stock. Increase the heat to bring to a boil and then lower to let your soup simmer for about 30–40 minutes, until the lentils are soft. If the soup looks too thick for your liking, add a little water, half a cup at a time. Brown lentils will require a few extra minutes of cooking time. When the lentils are soft to the bite, add in the spinach and turn off the heat. Allow the baby spinach to soften and serve. 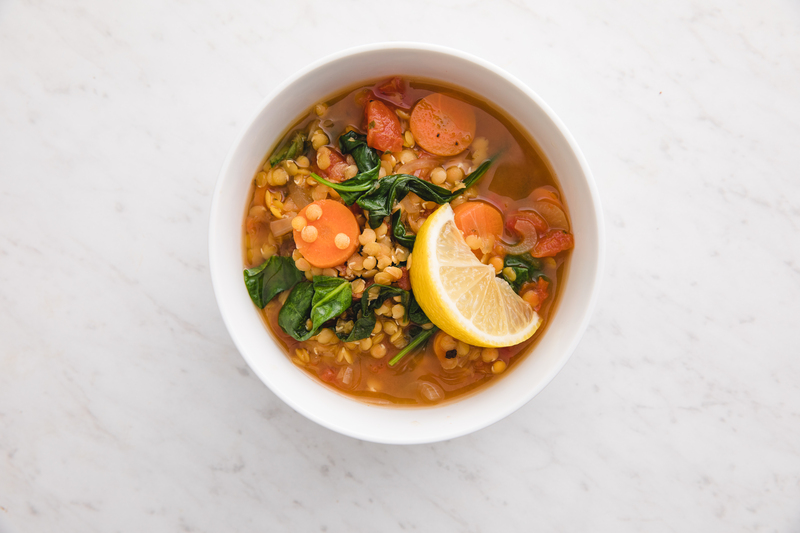 If desired, squeeze in the lemon juice (its vitamin C promotes the absorption of the iron contained in the lentils and in the spinach). Season with black pepper to taste. I made vegan cornbread mini muffins to go with the mini-soups. I added a tray of sliced tomatoes, drizzled them with balsamic vinegar and draped them with basil leaves, and added plenty of vegan pita bread and sweet potato chips. My entire snack ensemble was vegan! I got carried away and made the two signature cocktails vegan: a vodka martini with olives and a cucumber basil refresher. I am happy to report that the Greek vegan menu was a hit and got rave reviews from vegans and carnivores alike. The real test was that all the platters and dishes were empty at the end of the party, and I didn’t have to plant little signs that said “vegan” or “vegetarian” among my party trays. If you’re throwing a cocktail party sometime soon, you might want to consider partying like a vegan.